Staff cuts have struck Sega London and San Francisco today, as an email from Corporate Operations Officer Masanao Maeda informs employees of the termination of a combined 73 positions between the two locations. 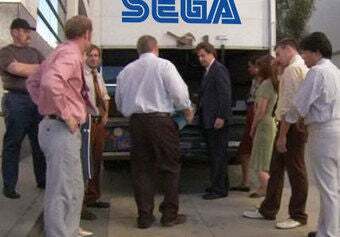 In the email, forwarded to Kotaku from several different sources today, Maeda cites a reorganization of Sega's business in the American and EMEA markets in order to improve efficiency and deal with a changing video game industry as the reason behind the cutting of 36 San Francisco and 37 London employees. We've reproduced the email below. As many of you already know, today SEGA will implement a reorganization of its businesses within the American and EMEA markets. The restructure reflects both the changing face of the global video games market and a need to improve efficiencies within the operation. As a consequence of this reorganization, the company has made the reluctant decision to reduce headcount by 36 employees in the San Francisco offices and 37 in London. Unfortunately for the employees affected by the reduction in our workforce, these meetings will take place this morning. Please be available in case you are called to a meeting with your department head. I also ask that everyone please be understanding of the situation and sensitive to your friends and colleagues during this difficult time. All other meetings will be cancelled and I will let everyone know later this morning when the layoffs are complete. A rather unpleasant email to find in your inbox when you arrive for work in the morning, which doubtlessly led to it being forwarded to us via multiple sources. We've contacted Sega for comment on the email and layoffs, but have yet to get a response as of this posting. "As of today SEGA will implement a re-organisation of its businesses within the American and EMEA markets. The restructure reflects both the changing face of the global video games market and a need to improve efficiencies within the operation. "In recent years, digital platforms have taken an increasing share of video gaming revenues and we believe this growth is set to continue. SEGA has already enjoyed commercial success within this new and exciting gaming medium and it is now the company's intention to fully embrace change and set a strategy not only to maximise revenues within the digital space but, through innovation and quality, take up a leadership position. Therefore, the company will be creating a new Digital division which will be based out of SEGA's San Francisco offices. In a similar move to drive efficiencies for the company, SEGA's London office will now act as a hub for the traditional console and PC side of the business. "As a consequence of this re-organisation, the company has made the reluctant decision to reduce headcount by 36 employees in the San Francisco offices and 37 in London. "The management team are confident that these necessary steps will benefit the company and allow it to continue to grow and adapt to the rapidly changing market. "More details of the restructured organisation will be given over the coming weeks."